These are the discharge amounts from Mogden and Hammersmith for the past two months, puts the issue into real perspective. There is also data now in answer to the largest amount in one event, and will get that up as well. Bear in mind that these are only from the pumping stations, so exclude and gravity overflows. Will try and get this into a better format later. Top work there Mr. H.
The dates with no figures alongside, am I correct in assuming they are dates when there was a discharge but no quantity figures available? They are the days when there was no discharge. But very likely the gravity overflows did spill, so we can more or less say sewage entered the Thames everyday, staggering to be honest. 26/27 August is probably more than June 6th, so why the dissolved oxygen crashed. Close run thing that we did not see thousands of fish killed again, but no doubt damage was done. So 691 million litres from Mogden in august! One cubic metre is roughly equivelant to 1 metric tonne, but does depend slightly on temperature. So we have been getting some research back and still waiting for more. The accurate records of discharges only go back to 2000, so its a benchmark since then. showed 2,245,568 m3, so tonnes. There was only one other discharge of more than 2 million m3, being 2,113,677 m3 on the 8th February 2001. Over the weekend of the 29/12 to 3rd Jan 2002/3, the total amount recorded was over 7 million m3 for the whole river. 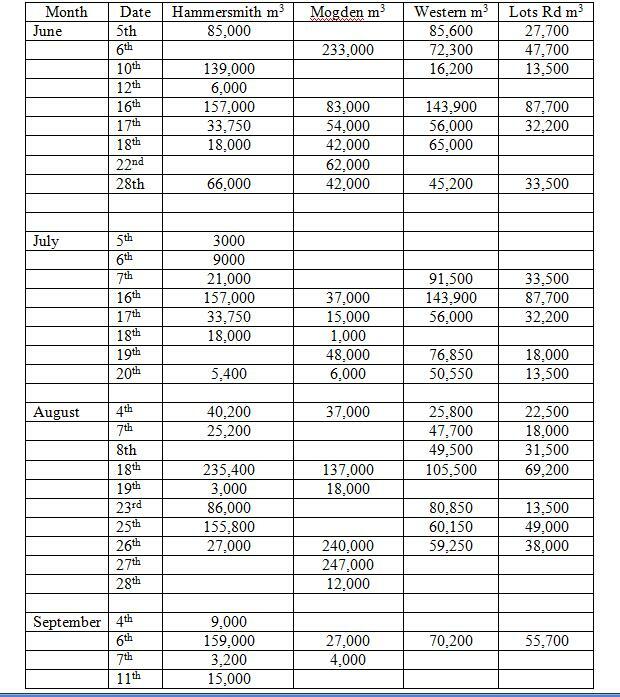 Looking at the 6th June specifically, the estimated amount from the Western end of the Tideway was 450,00 but then adding in Abbey Mills, Greenwich & Crossness, thats adds around 1.5 million m3. So in total for the 6th June it is over 2 million tonnes. Are we certain that thess figures are accurate? - sorry for asking but I'm just gonna put the following message up on Facebook, on my own page and also on the 'Our Rivers' page. Many of you will already know of the many serious pollutions of the Thames this Year. Bream, Flounders, Bass and Eels - European Eels being a species that are very much at risk, if not endangered. The sewage pollution is due to the storms that weekend when several overloaded sewers flooded into the river, it's calculated that a total of 450 million cubic metres was discharged, 200 million cubic metres of this was discharged legally, and quite deliberately, from the storm tanks at the Mogden sewage works in Isleworth. The dire effects of this latest discharge has been exacerbated by the fact that the Thames was at a very low level. due to lack of rain this spring, also due to the fact that the discharge was made at low tide. If you need more information on this matter, a Google news search with the words 'Thames pollution' will bring a host of news articles, including the BBC London News and ITV London today, also articles from the Guardian and other newspapers. The above figures apply only to the Mogden Water treatment Plant plus the calculated amount released by the many sewer overflow outlets, which also discharge raw sewage directly into the Thames - However, recently published figures suggest that on June 6th 2011 specifically, the total amount of Sewage released from the treatment plants at Mogden, Abbey Mills, Greenwich & Crossness totals over 2 million cubic metres. Finally, to put things into perspective, 2 million cubic metres of sewage would be enough to fill approximately 900 Olympic sized swimming pools. into the Thames from various TW sewage treatment plants. positive changes to the Thames and it's tributaries. " PS - please don't hesitate to suggest any changes or additions the text of this message. Abbey mills is on the river Lee but it empties into the Thames at Leemouth only a very short distance, so is still Thames sewage, just one for info. Makes little difference as all goes into the Thames, 16 million tonnes of it. If you could hold fire for a couple of days as hope to have all the data for June next week, then that will give a fuller picture and more to add. On the 6th June they have stated it is the 'western end of the Tideway so may include Hammersmith pumping station, a question which will be answred with all the June info. ............If you could hold fire for a couple of days as hope to have all the data for June next week, then that will give a fuller picture and more to add. 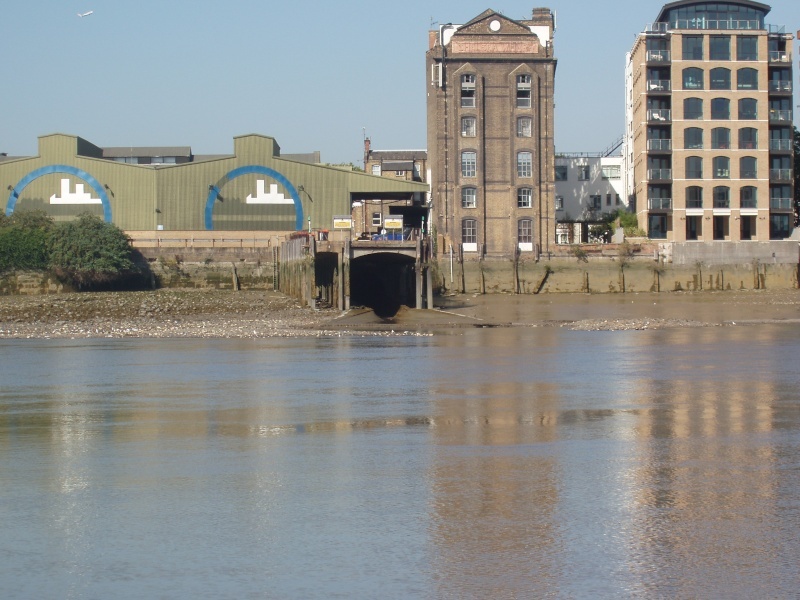 On the 6th June they have stated it is the 'western end of the Tideway so may include Hammersmith pumping station, a question which will be answred with all the June info. No probs. I can help you with that as have done it before. Thanks David - I'd appreciate as much help as possible. Just had a look at Facebook and it appears that you can create a page dedicated to any subject, be it a celebrity fan page, personal page or even a CAUSE - I reckon we have a good cause here and it could get a much wider viewing audience than almost anything else. I'm really disappointed that of all the emails I sent out to the editors of the angling press I've not had one reply - not even an acknowledgement. PS - I'm not crazy really, despite what my avatar might suggest....honest guv. just clicked on to the e-petitons jobby regarding sewage, than realised i had already signed it, depressingly the number of signatures in the right hand corner, read "40", Kind of sums it all up. Dave, if you are going to use this at the Tunnel presentation ( ), each metre cubed = 1 tonne. shocking - bloody shocking ! what a disgrace ! nothing else to say !! The tidal could be the most amazing fishery if the sewage was stopped. its crazy. lots of times in a month every month. no wonder the salmon fiasco failed. what a top class fishery the thames could become . if it made the top half of most improved river there must some terrible ones out there. A total of - 4,982,250 TONNES!